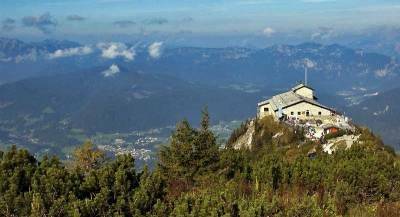 When you visit Berchtesgaden, take Bus #838 to the Eagle’s Nest (Das Kehlsteinhaus), which towers over the valley. 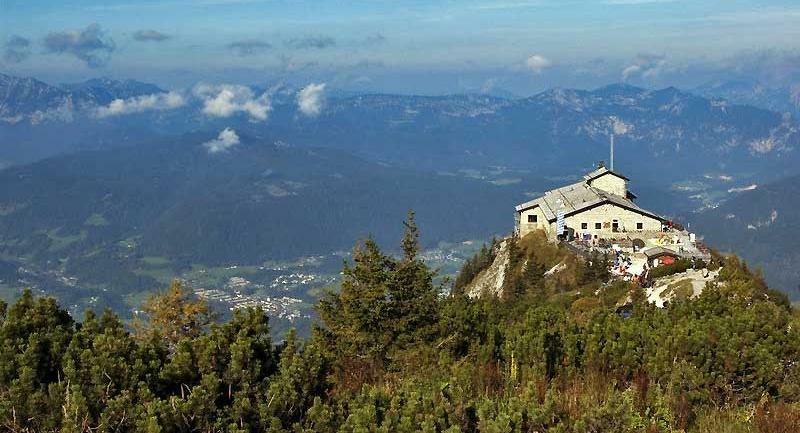 This was Hitler’s mountain retreat, built specially for him. There’s a parking lot at Dokumentation Obersalzberg, which is where the #838 stops. From there, visitors transfer to special buses for the final ascent up a 24% grade. The ticket booth for the special buses is somewhat hidden to the lower parking lot. The Dokumentation Obersalzberg museum is at the back of the parking lot. Bus #841 runs from Berchtesgaden to the Königssee and takes about 10 minutes. 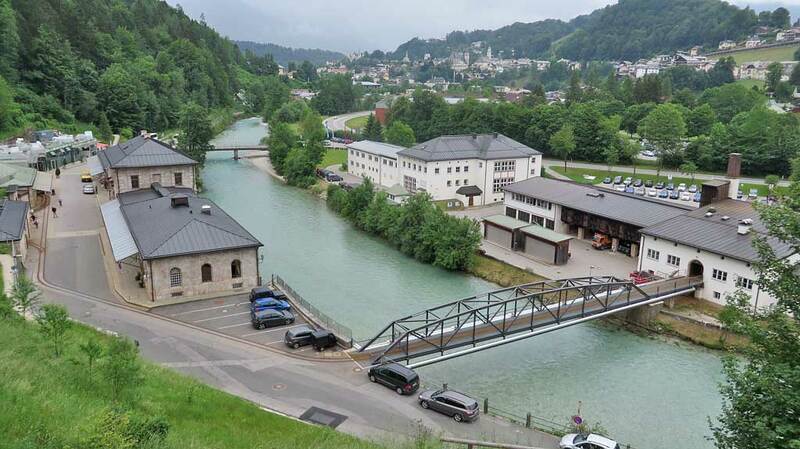 There you will find the Jennerbahn Cable Car for views of the Königssee and the Bavarian Alps or, from the same parking lot, Cruise the Konigssee on an electric boat to St. Bartholomew. 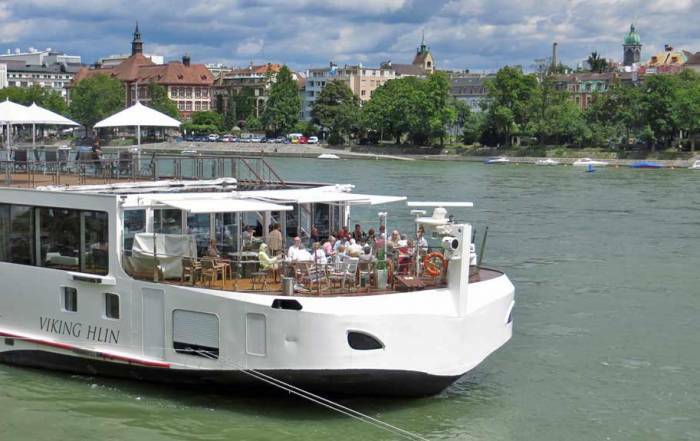 Tickets for the boat cruise are sold beside the dock. 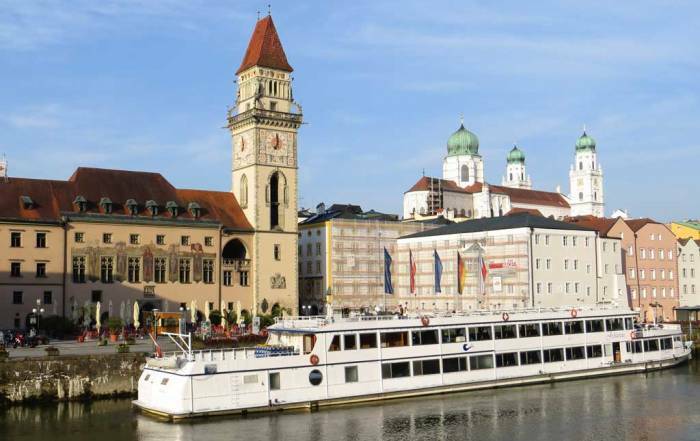 Halfway across the lake by boat is a stop for the picturesque St. Bartholomew (Bartholomä) church and a restaurant. Hike about 1.5 hours from this stop to the ice chapel at the foot of the eastern face of the Watzmann. From St Bartholomew there’s an option to take the return voyage or to continue by boat down the lake to Salet and then return. 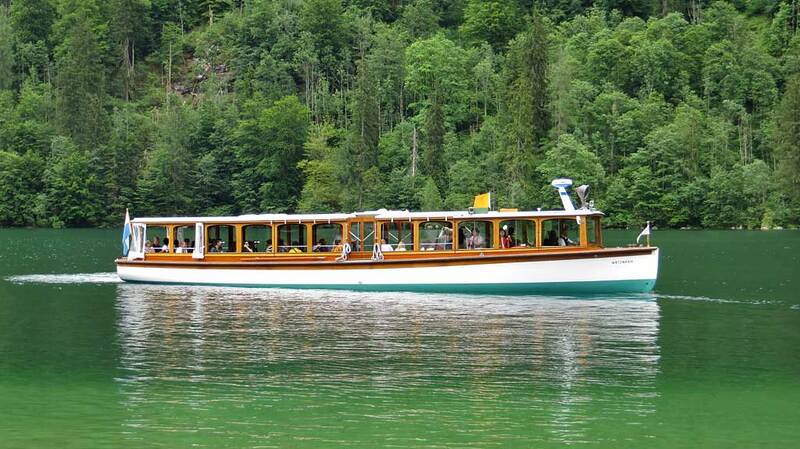 The cliffs along the Königssee are steep and it is not possible to walk back, so don’t miss the last boat. 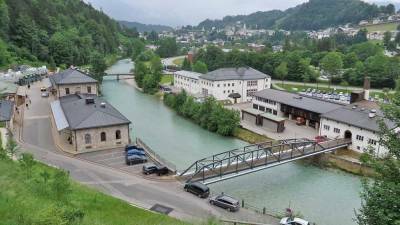 The Salt Mine Berchtesgaden (Salzbergwerk Berchtesgaden) is located in the town and offers underground tours. 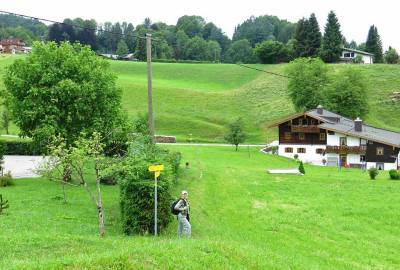 It’s a half hour walk from the bus station or a short bus ride on Bus #840, which is also the bus that goes to Sazlburg. The Salt Mine Berchtesgaden is frequently incorporated into day trips from Salzburg. It includes a salt raft ride and a train ride around an underground lake. About 15 minutes west of town on Bus #846 is the frequently photographed St Sebastian Church (Pfarrkirche St. Sebastian) at Ramsau bei Berchtesgaden. 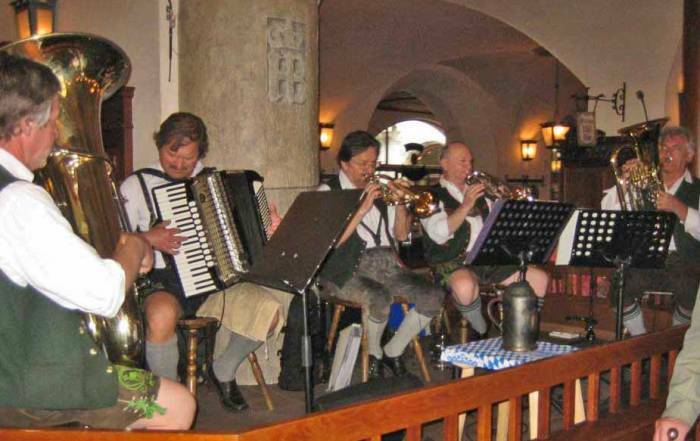 German beer, radler (half beer half, half soda or lemonade), bockwurst, bratwurst, sauerkraut, spätzle (egg noodles), schweinebraten (pork dumplings), potato dumplings. 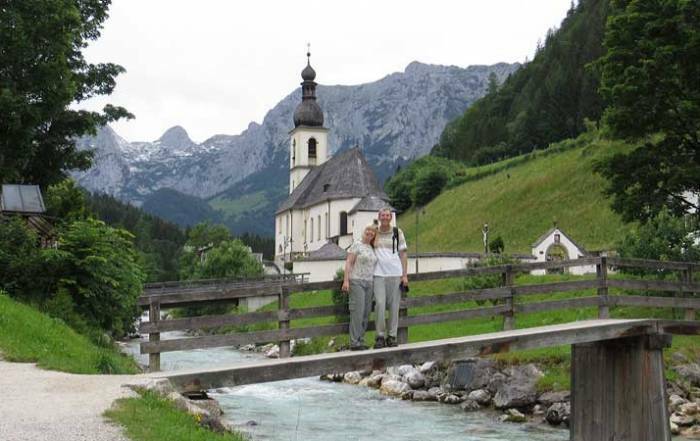 May to September are the best months to visit Berchtesgaden for comfortable temperatures, but Berchtesgaden weather in summer also has the highest for rainfall and drizzly weather. Expect average highs to peak in July and August at around 75 F (24 C) with average lows of 57 F (14 C). The Alpine setting means that winter will have great skiing. Average highs for December – February are just above freezing, while average lows are a few degrees below freezing. Berchtesgaden is in an isolated alpine region of Bavaria. 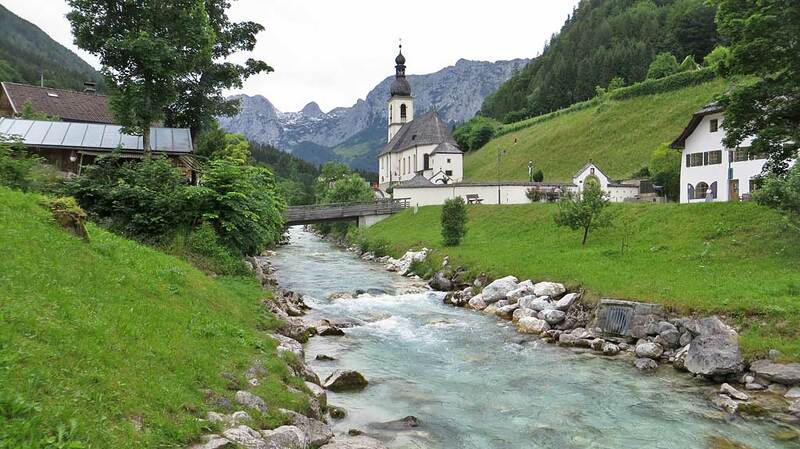 You can get to Berchtesgaden through Salzburg, which is the gateway to the Austrian Alps. There is an airport in Salzburg, but most visitors get to Berchtesgaden by train from cities such as Linz, Vienna, Munich and Innsbruck. From Salzburg you can get to Berchtesgaden on bus #840 after about a 40 minute ride. You can catch the #840 bus from the plaza at the Salzburg main train station. Bus service is frequent and tickets can be purchased in cash from the bus driver. There is also train service to Berchtesgaden from Salzburg, but because it’s a German train, it takes a longer route through Germany. Bus passes for the day are inexpensive and bus service from Salzburg to Berchtesgaden is faster than the train. The bus station in Berchtesgaden is in front of the train station. All the buses in the region travel through the main bus station, so it’s easy to head to the Konigssee, the Eagle’s Nest or Ramsau. 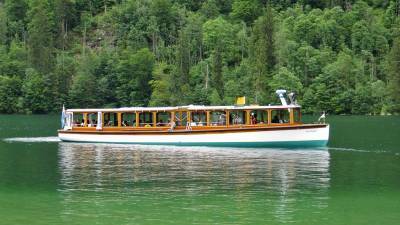 BigBoyTravel provides excellent transportation advice for getting around Berchtesgaden from Salzburg airport. Berchtesgaden is a small town of about 10,000 people. It’s located in Bavaria. I n this area, Germany extends in a small peninsula into Austria. 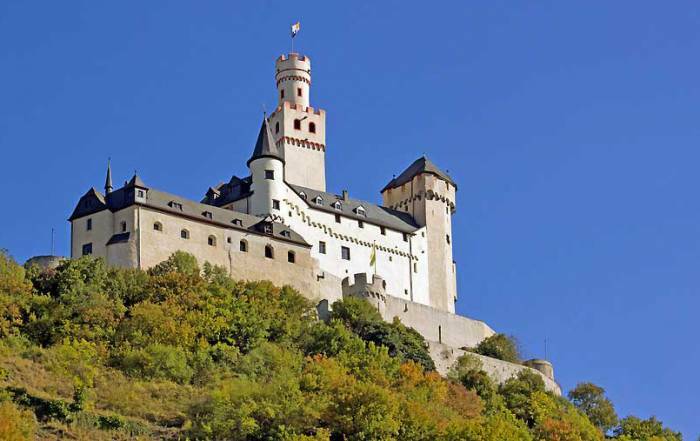 The nearest major city is Salzburg, Austria. Salzburg is about a half hour from Berchtesgaden. Due to the unusual shape of the border, Berchtesgaden is basically south of Salzburg, but other cities in Germany are north of Salzburg. Berchtesgaden National Park contains the Watzmann, which is the third highest peak in Germany. Adolf Hitler loved to vacation here. His Eagle’s Nest was built above the city for his 50th birthday. The upper ranks of the Nazis spent their vacation time here and also planned their war strategy.